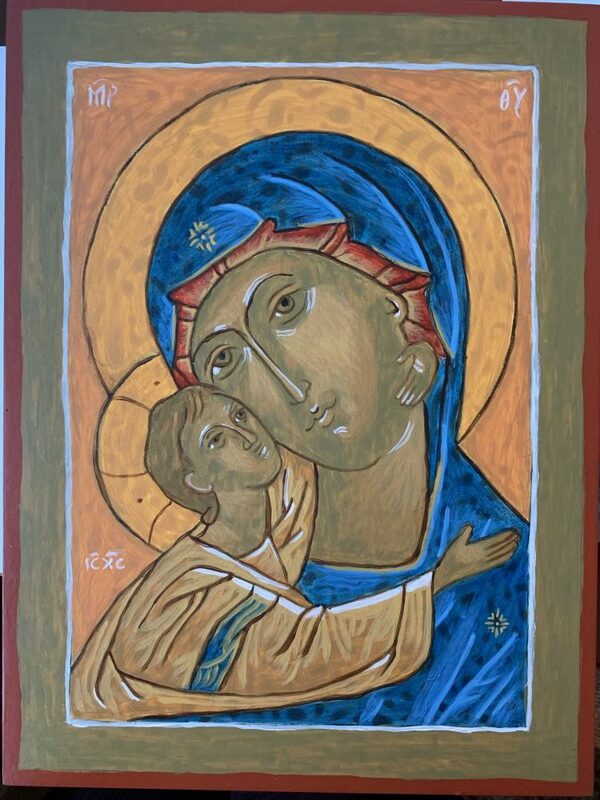 A “true” or “canonical” icon is most often said to be “written,” for it is indeed theology written in the language of colour and form. Every line and each choice of colour, dispositions and relationships of persons, proportions and perspectives all have their deep and specific meaning in a true icon. Theology written in the language of colour and form. 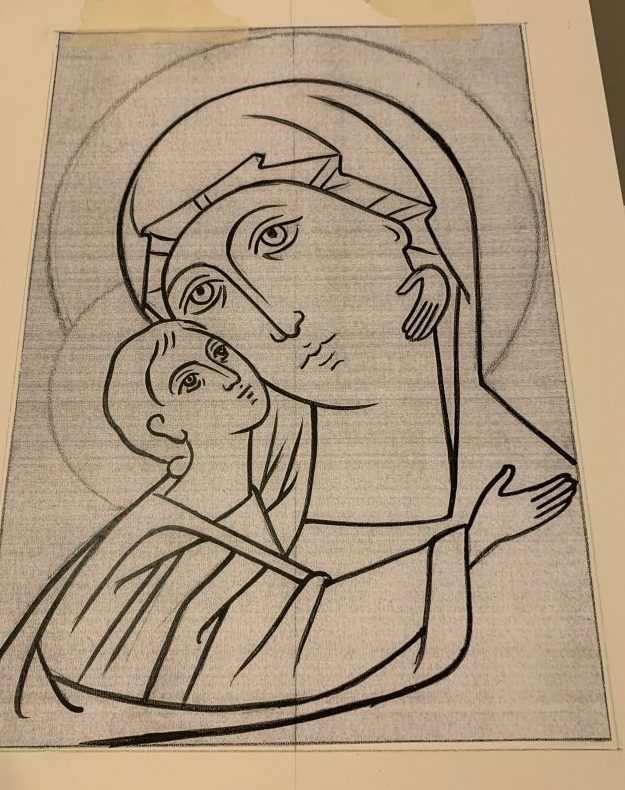 I have always thought of theology as written or spoken words, but last week I attended an icon workshop and a whole new world opened to me. It was my first opportunity to write an icon and I found it to be both fascinating and frustrating. We started by tracing an outline of the image on a white board and then added black shadows in the places that would later be dark in colour. Unfortunately my board would not absorb the colour and I soon ended up with black beads all across my board. 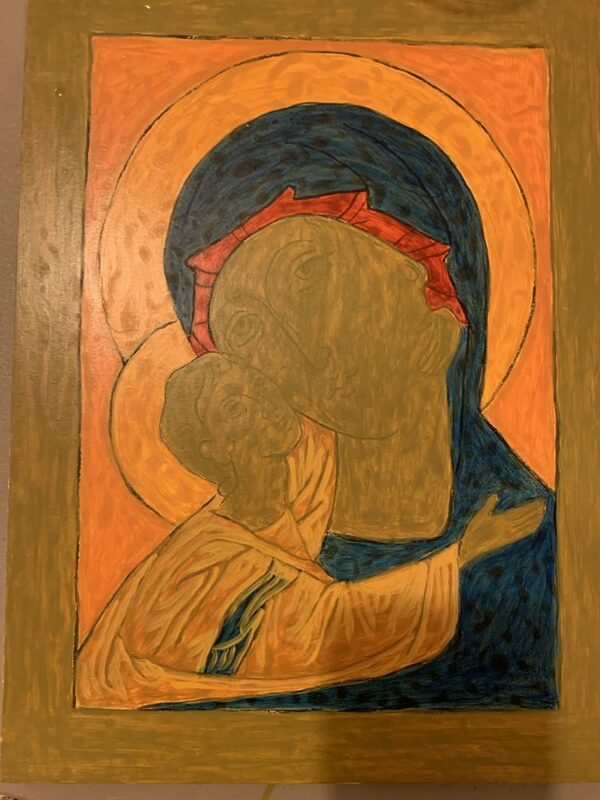 Undeterred the iconographer, Peter Pearson, applied a yellow wash. Again my board reacted in a strange way — my wash made it look as though Mary and Jesus had measles. “It doesn’t matter.” Peter kept saying, the layers and highlights will cover it. I thought he was just trying to placate me. Suspend judgement, let go of the need to create the best icon ever – yep those were definitely words I needed to hear. 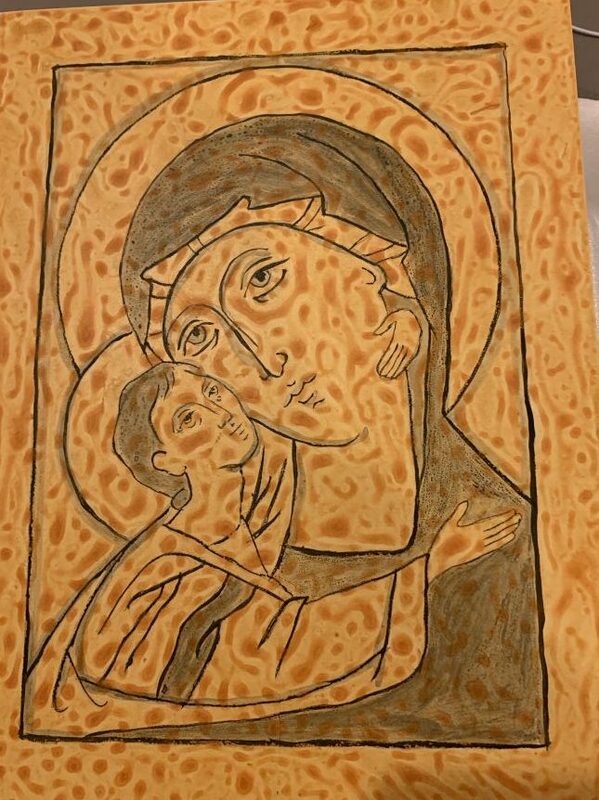 Then we applied our base colours and not only the mottling but the whole image seemed to disappear. “How will I ever get this to look the way it should?” I wondered. What happened to the faces? But Peter was right. As we added highlights, sometimes blocks of lighter color, sometimes just lines, the true image popped into being. It was amazing, a prayerful and profound experience. One thing I realized as I looked at my finished icon was that I was very aware of the imperfections — brushstrokes in the wrong places, messy paint, and some of the blemishes still visible, but the further away I got the better the image appeared and what others saw was a beautiful and they thought, professionally done image. When I got home I ordered Peter’s books A Brush With God, and praying with my icon and reading the book has profoundly impacted me. Over the week I have spent much time reflecting on my image and the lessons it has and continues to teach me. How often I have felt like that board with the yellow wash – diseased and ugly without any hope of redemption and God says “It doesn’t matter, you are a work in progress, my colours, my highlights, will cover all your blemishes.” I didn’t believe it at the time but God has covered a lot of what I considered ugly with divine “paint” – layers of love and care that cover all my blemishes. There are times in my life that God has layered so much love over me that not only the blemishes but the whole image of who I was seemed to disappear. All I can see is a faint outline of the true image of whom God intends me to be. As God adds highlights to my image, the divine image hidden within appears and the richness, the beauty and the wonder of God’s image within me is revealed. There are proscribed ways to write an icon. 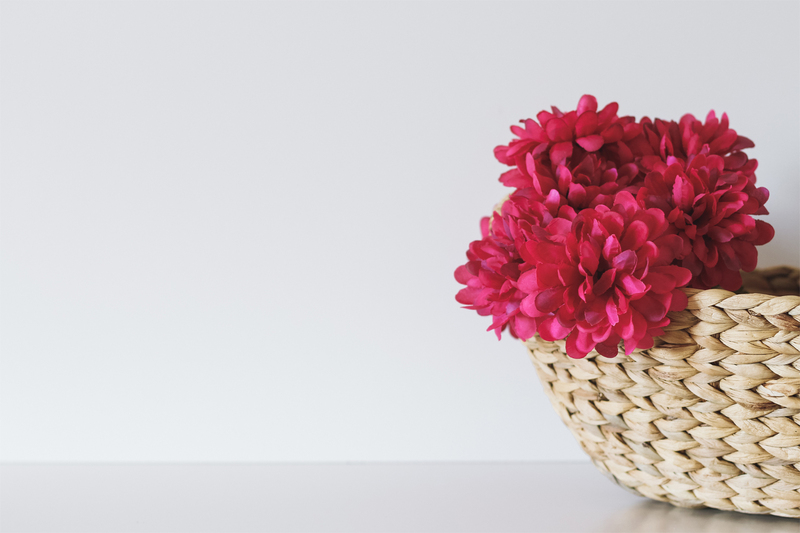 Colours with meaning, shapes with a purpose. All of this to portray an image that is true to the community tradition, the cultural reality rather than my individual perception and imagination. 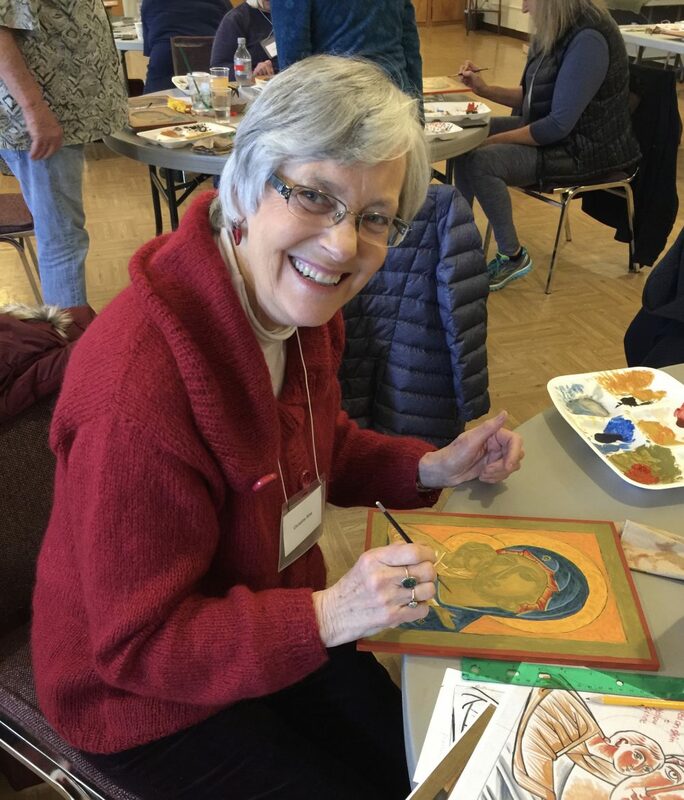 Peter suggested that we pray with each brush stroke, allowing the rhythm of our brush to flow to the rhythm of God’s words emerging from within us. This week, all my prayers seem to emerge as a brush stroke adding to the divine image not only within me but within all I interact with. 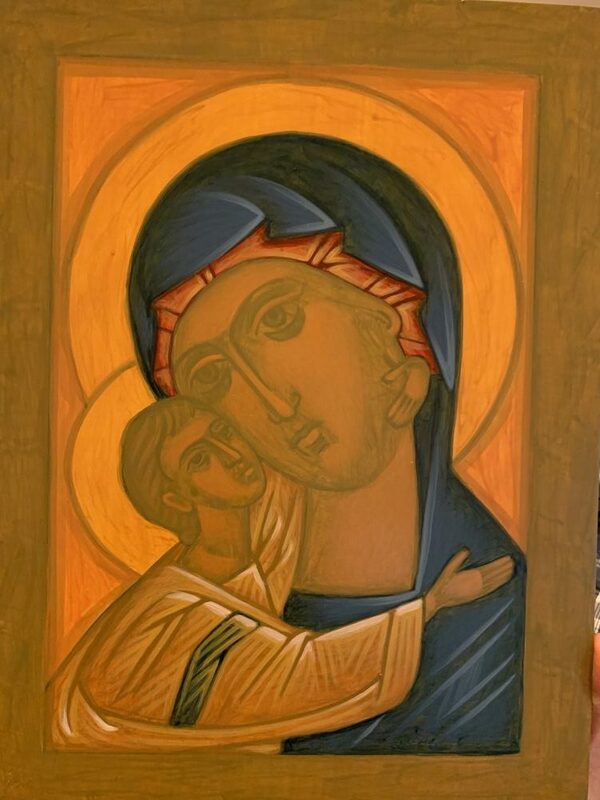 My icon now sits on my desk as an inspiration for further refection and contemplation. I am not sure that I always look through it to the revelation of God it can inspire in me. It is still too easy for me to be caught in the imperfections of what I have created, but that in itself is a revelation. As I am able to let go of myself flashes of inspiration and at times breathtaking revelation seem to happen. How often am I caught up in my own imperfections which hide the doorways through which God wants to reveal more of the divine image and the holy way of life intended for me? Perhaps that is a question that all of us should reflect on. 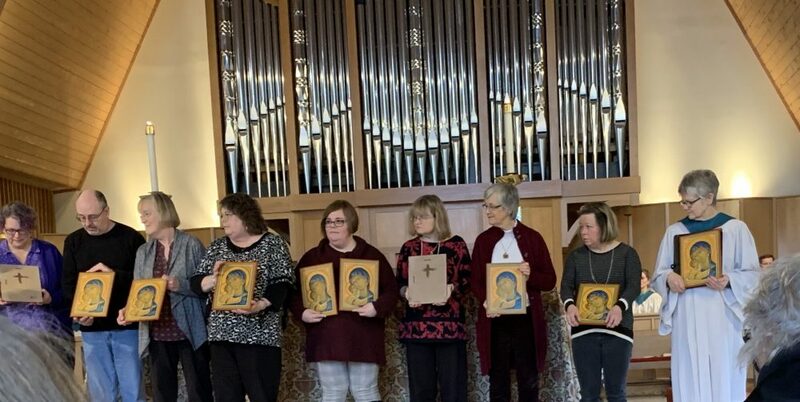 For those who are unversed in the art of iconography Windows to Heaven: Introducing Icons to Protestants and Catholics is a great place to start. NOTE: As an Amazon Associate we receive a small amount for purchases made through appropriate links. Thanks for supporting Godspace in this way. Have You Met God Face To Face?